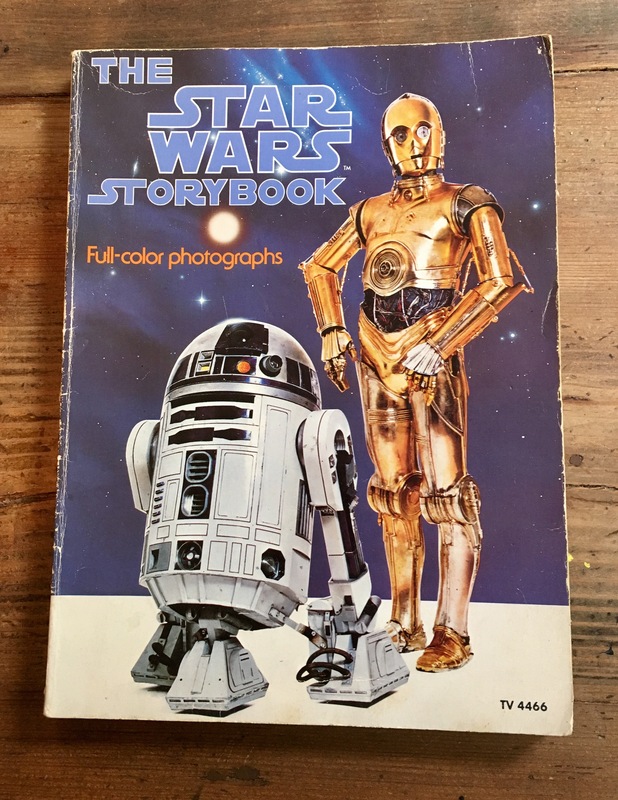 Among the handful of mementos I’ve kept from early childhood is a spine-cracked, dog-eared copy of The Star Wars Storybook (pictured here). Published in the wake of the blockbuster movie, the storybook rehashed the real Star Wars in scene summaries, quoted lines, and screen grabs. It left out lots of detail from the live-action film, not to mention all of the special effects, but I still loved it. So much so that I read it over and over again, until I practically knew it word-for-word. It became a bit of an obsession, really. When I was seven years old, I’d invite friends over to my house to play “Star Wars,” and then insist not only that we reenact the movie scene-by-scene but that they deliver their lines exactly as printed in the storybook. Deviation was punishable by a “let’s try that again,” delivered as if I were George Lucas himself. And, of course, I always got to be Luke Skywalker. Always. This was good advice, no doubt, but it missed the larger irony of the situation. You see, unlike most of my friends, I had never actually seen Star Wars at this point. I had memorized The Star Wars Storybook, but I had chickened out of watching the movie after seeing a trailer that included Darth Vader’s initial entrance scene, which I found utterly terrifying. In other words, I pretended to be the consummate Star Wars expert, even though I had never seen the movie. And I assumed the heroic role of Luke Skywalker, even though I was afraid to watch his film. Clearly, this was silly of me, not to mention a little deceitful. Just as clearly, though, it’s pretty consistent with how we humans often behave, even as adults. We act as if we know more than we really do, and we look for ways to assume directorial control–even when (perhaps especially when) we’re secretly afraid of some deep dark unknown. And we cast ourselves in all the best roles when we tell our tales: The hero who’s under attack? That’s me. And the villain from the dark side? I think you should play that part. We rarely risk revealing our own ignorance or grappling with our fears. As a result, we miss out on bigger-picture opportunities–on the chance to experience adrenaline-packed adventures, to get to know multidimensional characters, and to wonder at all sorts of special effects. We forget that the first step toward learning is admitting that we don’t really know, and that being a little scared is part of almost every new discovery. Be aware of the stories you tell yourself–about both yourself and others. And beware of the stories they tell themselves and you. Don’t let your familiar stories (or scripts or roles) define you. Make sure you’re an author, not just a character. Don’t be afraid to admit your ignorance, or foolish enough to let fear rule you. Fear is the dark side, my dear, and you are a creature of light. Also, remember that the Force is strong in you. As a (self-appointed) Jedi, I can feel it.